the bee in the d.
a suburban-city girl stumbling her way through central PA. Here comes the wrath of God: the bike lanes are officially open today. In case you were unaware, the City of Philadelphia has removed one lane of traffic from both Spruce and Pine streets to allow for a lane for cycle-specific vehicles. Unfortunately, people either 1. do not know or 2. do not care. The radio was full of idiots this morning calling in to complain. One of the largest complaints was that the city is already congested enough and the motorists NEED those traffic lanes. "They go from river to river!" they cried. I live on Spruce. I walk part of it almost every day. It's probably one of the least congested streets in all of Center City Proper. That's probably why the city picked those streets, instead of Chestnut or Walnut or Market. The volume of traffic on Spruce pales in comparison to Walnut, which runs in the same direction. Perhaps it will change. Perhaps the advent of the bike lane will cause more congestion in motor vehicle only lane on Spruce. Perhaps, but we will have to wait and see. This morning I saw the bike lane being used as both a driving lane of traffic and a loading lane. The lanes are clearly marked on the street with a bike symbol. Since it's only the first official day, I guess I should give drivers a few days to figure it out. While clearly marked on the street, there are not a lot of signs up. I spied a crumbled "Bike Lane Coming Soon" paper sign strewn in the gutter the other day. You might want to consider a more permanent sign, Philadelphia. The most unfortunate thing about these lanes, however, is the amount of bitterness and hatred it brings out in people. One woman even suggested hitting cyclists if you should see one in the driving lane when there is a bike lane available. She actually said that. She actually advocated for violent action against other human beings. On the radio. Not in her house, not in her car, on the radio. In a city that is up in arms over the signing of Michael Vick, it makes me question something I read a few weeks ago, back when the signing was fresh (though, for the life of me, I cannot find to link back). But it made me think, do we value the lives of animals over the lives of other human beings? Perhaps it is because we believe dogs are defenseless when they are being strung up a tree. But how is a person on a bicycle NOT defenseless against a two-ton hunk of metal flying down the road at 30 MPH? Is it because we can easily write it of with a "they should have known"? As in, "they should have known to stay in their own lane and not get in my way." Because we can't share the road. No one wants to. We are all selfish, bikers, drivers, pedestrians alike. We all get around like we own the city streets, that it belongs to us, and that those other people are using it wrong or inefficiently, thus causing us to be inefficient. And God forbid that. We hold our own race to a higher standard, because we have our own thoughts, volition, and free will. Is that the reason for the disconnect? Because we can stand up for our rights, instead of barking for them? Another caller said, "there are more of us than there are them." In other words, cyclists shouldn't have the right to their own bike lane because they are a minority. I was wrong to call these people idiots. They do bring up valid concerns on congestion in the city. What they don't bring up is solutions. Everything, on both sides, is "mine, mine, mine." Again, because no one is willing to share the road. The city is not a wasteland that we can continually grow outwards. The city government can't just go around widening streets, knocking down blocks of homes and businesses just to accommodate a parking lane, two lanes of traffic, a bike lane, a sidewalk, and some buffers in between. Perhaps that would work in theory. Perhaps we could all get along if there was a giant expanse of road that allowed for everyone to travel at will at the same time. What would make this road even more amazing would be the lane for the subway/light rail/whatever. But it's all a theory, it would look totally ugly if it were actually implemented and the fact of the matter is that it can't be implemented. We just don't have that much land to dedicate to transportation. And why would we even want to? Since we can't expand outwards exponentially, we must look for solutions within the confines of the grid. We need to look at ourselves and how our own actions are helping or hindering our city environment before getting caught up in a finger pointing of who's fault it is. We can start by being nice. Or at the very least, being respectful of others. The bike lanes on Spruce and Pine are there, whether you like it or not. Do not use these lanes as your own personal vendetta against bikers or as a middle finger to The Man. Don't cut each other off so you can make the right hand turn first. And cyclists? Be appreciative and respectful of the cars on the road. You are a delicate being on delicate equipment up against a car who is the antithesis of delicate. In reality, it won't matter to you who's wrong or who's right if you're dead. 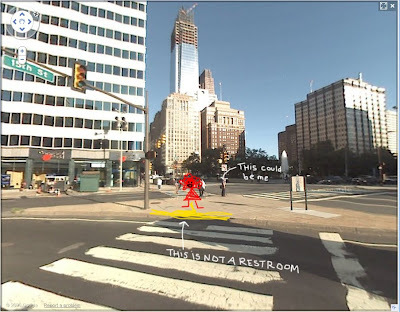 So, Philly, can we start there, by being more respectful towards the people in our own city? Can we? I'm sure the idiots on WIP have been vomiting up reasons why the Eagles didn't win all day and night since Sunday afternoon. I'll bet it goes something like this: "Kevin Kolb should not be starting, hell, even playing, in a big league like the NFL." I cannot count the number of texts and emails i got that were along the lines of "Garcia would've won this game." It's a pretty topical debate, this QB issue. And then toss Vick in there for some happy holiday stew. So blame whomever you want. Blame Kolb, blame Reid, isporticus is blaming Donovan. But I know who to blame. I know exactly who to blame. It's not the wind or the celestial powers that be or any quarterback who is or is not wearing an Eagles jersey. It's Turkey Hill. Yes, Turkey Hill. 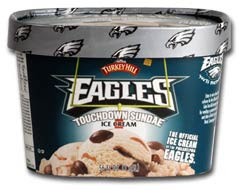 The Office Ice Cream of the Philadelphia Eagles. Where were they this Sunday? I've had Turkey Hill Eagles Touchdown Sundae cup every time I've been down at the stadium. Sometimes, I have two. On my way down to the game this past Sunday, i got the disturbing text: "Can't find any touchdown sundaes! This is sadness!" sent at 12:15. Low and behold, I couldn't find those precious, delectable, free samples of ice cream anywhere either. Sadness, indeed. At that time, I had no idea the gravity and severity of the missing ice cream. You can't just be going about, changing up game day rituals. That's insanity. How can we be expected to win, when we can't even find a sundae full of touchdowns? I've got a little story for you today. It's a slightly old story, but with a new twist. Yesterday, I was walking home from the doctor's office shortly after the lunch rush started. Minding my own business, just trying to get home. I cross JFK, near City Hall, headed south. In front of me, on the island at 15th and JFK, an older woman pulls up her long, flowy, hippie-dippie skirt and proceeds to start peeing. PEEING. She lets it all out, like a fire hydrant, IN THE MIDDLE OF THE ISLAND. It was a solid pee. The gal's clearly drinking her eight cups of water a day, I'll just say that. When she finishes, she just drops her skirt back into place and moves over to crosswalk and waits for the light to turn green. Like nothing happened, like she didn't just pee in front of Michael Nutter's window. I was appalled. I didn't know what to do. I wanted to yell, "WHAT MAKES YOU THINK THIS CITY IS YOUR PRIVATE TOILET, LADY!?" But I didn't. I mean, the woman lifted her skirt to squat in public, who knows how she would have reacted to confrontation. There weren't any cops in the near vicinity, so she didn't get arrested and by the time I passed a cop, what was I going to do? Say, "Yes, excuse me sir, but someone just peed on the island. You might wanna call someone to get a mop out there." As of that point yesterday, our libraries weren't even staying open, let alone sending a Pee Crew out to wash away the public outhouse known as City Hall. And just because I'm not sure that y'all really understand what was happening here, I've created a little image to go along with my narrative. Thanks, Google Street View!! Oh, hello old friend! Oh, look at you, you're such a mess, you little blog, you. you're all covered in dust and nobody's looked at you in months. poor thing, comb your hair. you look like you just rolled out of bed. frankly, you look a little like how i feel. let's agree to not channel courtney love, shall we? it's been nearly a year since i moved back to the philly metropolitan area. almost to the date. september 20th, if i can recall correctly. so, hello year moving anniversary! let's reflect! hip hip hooray! reflection time! and what a perfect time for reflection, too, no? it's anniversary time, autumn equinox time, and i'm about to start 30 days of yoga at the Dhyana studios. i was really excited about this yoga stuff for the past few days. really excited, until today. today, when i started to plan out my month of yoga classes in my google calendar. i've already noted three days where i'll have to do some home yoga practice in lieu of getting to a class. i've already noted that i can't possibly make ANY morning classes and still get to work on time. i've already planned a week of classes. and i'm about to cry. i'm completely overwhelmed. i'm worried that i can't do it. i'm worried that it'll hurt. i'm worried that my head will pound for days and i'll cry and won't be able to sleep and be totally exhausted and that the demons and toxins in my body will scream in agony as i exorcise them out with practice. i'd almost rather keep the crazy locked up behind bars in the cell of my body. strike that, i WOULD rather stay crazy and full of toxins; it's easier. i'm just that weak. but i've made the decision. i've told my friends. i can't not follow through now. so naturally, i did the only thing that made sense and i googled it. read some other people's blogs about their bikram yoga 30 day journeys. it didn't make me feel better. i still have a headache. i still want to cry a little bit. i think i'm just going to go eat lunch instead. which stinks because i totally forgot my leftovers in the fridge at home. it's also particularly stupid of me because there were two options and they were both good (1. sam's market tomato pie or 2. palace at the ben chicken cashmere). boo. double boo. actually, i lied. the only good thing about reading other people's blogs on 30-day bikram challenges are that those crazies were doing BIKRAM for a month. 100+ degree rooms filled with tough-as-nails teachers? screw that. photo stolen from upi.com. whoops.